In providing emotional support to families with a dementia patient, the first thing you need to do is to sit down with them and talk about how they feel. This is important so that you will know how they really feel, and what their thoughts are regarding the situation. By talking to them, they are able to express their real emotions to you. On the other hand, you may be able to recognize what their deepest needs are at the moment. Just by talking to the family members is enough to make them feel that they are well-supported, and that they are not alone in this battle. It is one of the ways of showing to them your willingness to help, so you can shed light on the situation they are facing. Having a dementia patient in the family is often stressful. A family member can show signs of depression, irritability, anger, and anxiety over their situation. Because of this, healthcare professionals must constantly monitor the family’s health to ward off the danger of these signs. Healthcare professionals must make sure that all members are not showing signs of social withdrawal. It is often common for these people to experience extreme tiredness, they have sleeping problems, elevated vital signs, and ulcers. At Peachtacular Home Health Care, we make sure that we address these issues right away. If you think that there is a need for the entire family to go through counseling, then it is something that you can include into your care plan. Counseling really helps because it enables family members to learn the proper ways to cope up with their situation, and ways to properly manage their emotions. Through counseling, important questions will be raised, and answers will be given for the family members to have peace of mind. In our Home Health Care in Metro Vancouver, we have healthcare professionals who can counsel you once they find the need to. Through this, families can get the kind of help they need, so they can have a better perspective of what they are going through. As a healthcare professional, one of your roles is to guide the family members on what to expect, and on what to do. For sure, after all that has been said and done, some of them are going through emotional whirlwind deep within. In fact, it is possible that most of them have not yet recovered from the situation that they are facing. Because of this, family members are clueless on what they should do. If they are not guided, the situation will only frustrate them. There is no one who can better help these people except the people in the healthcare setting. 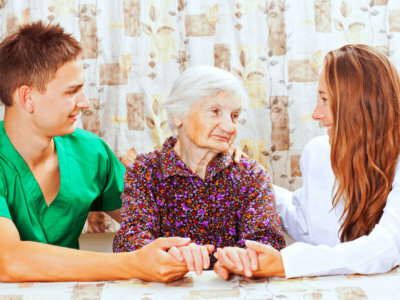 Here at Peachtacular Home Health Care, our healthcare professionals are highly trained to provide guidance to our patients and families, especially those with dementia patients. If you need guidance, you can call us at 778-859-2695. In our Private Affordable Home Health Care, we encourage families with dementia patients to join support groups because of its benefits. We have healthcare professionals who can educate the families on what to do, and how they can cope up with the news. Further, support group is a way for families to receive emotional support from others within the group. It is also one way for the families to meet new people, create connections to local resources and more. The goal is for the entire family to be able to meet their emotional needs. We believe that they cannot fight this batter alone. They need to be surrounded by people who understand and support them. If you want to know more of our services, you can call us at 778-859-2695.